The Person Details module is present by default on person pages. You can also deactivate/activate a person or delete it. BeeBole will automatically generates IDs for all employees. However, you have the option to define a specific ID for each using the ID field. In that case, the ID displayed in your reports will be the ID defined in the ID field and not the ID automatically generated by BeeBole. If you need to add more information on a person, please have a look at the Custom Fields module. Deactivating a person makes it impossible for the person to record hours. But all historical data recorded will be kept. Just click on the Deactivate button in the bottom-right corner to deactivate the person. The person hours will remain in your reports since the historical data are kept. To reactivate a person, just click on the Activate button in the bottom-right corner of the module. The button will only appear if the person is inactive. Deactivating a person will also deactivate his/her user, preventing future login. You can always reactive the user if needed in User Details. will inactive as a person, but will have an active user. Only a deactivated person can be deleted. If a person is inactive, a Delete link will appear. Click on it to delete the person and all the hours recorded by that person. Warning: the possibility to delete a person with hours recorded only exists for accounts in trial. Click on the picture to access the picture URL field. BeeBole do not store the pictures. You will need a public URL for the picture. Solution such as Gravatar are quite popular. 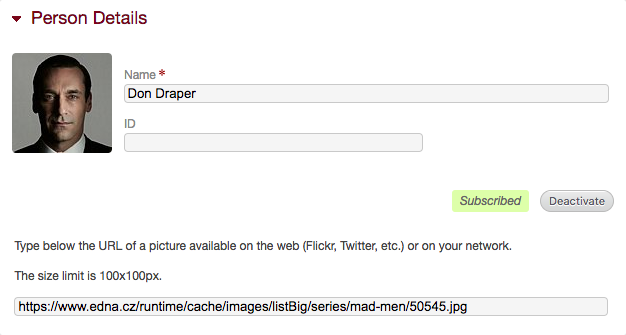 Click again on the picture to hide the picture URL field.